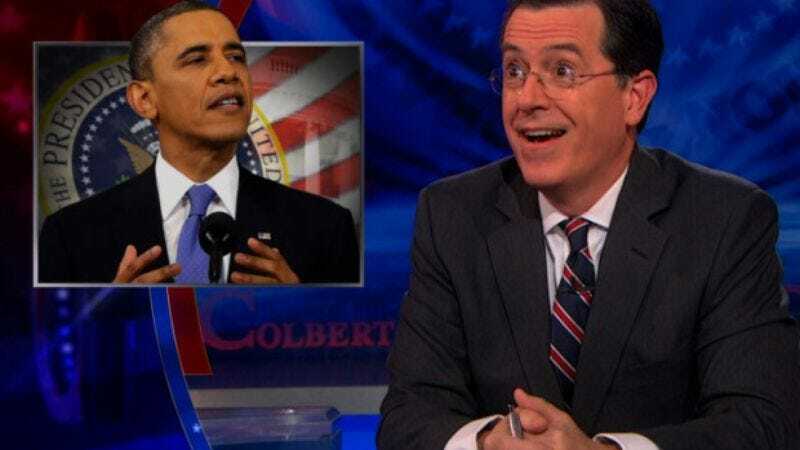 While it’s not as great a send-off as having the character “Stephen Colbert” host the White House Correspondents’ Dinner one last time (that honor went to Cecily Strong), it was announced last night that President Obama will be one of the final guests on The Colbert Report. The finale of the Colbert’s satirical news show will be December 18, but before that, President Obama will guest this coming Monday, December 8. Well, it’s four years later, and look who’s singing a different tune. Of course, this isn’t the president’s first appearance on the show, but it is his first since he was back on the campaign trail of 2008, when he awkwardly put distractions on notice (via remote). Perhaps it was the memory of that wooden sketch that’s kept the president away from the eagle’s nest of Colbert’s show since. Or, most likely, it’s the possibility of being on the receiving end of a similar verbal assault that Colbert has unleashed on other men of great power, like President George W. Bush and Chevy Chase.